This river is the second best river in Malaysia.You will plunge into the "Hydraulic",First Canon","Se cond Cannon","Last Rapid" and many more rapids. "An experience of a lifetime." Doesnt this look like fun??? Come and get wet with us this year! Welcome to Splashing Malaysian Rivers! 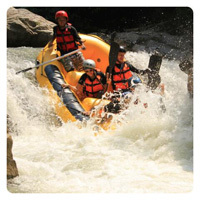 For over 7 years, guests just like you have enjoyed Xventure Mind whitewater rafting day-trips and our varies activities on the famous Selangor River, Ulu Slim River and Gopeng river. Our rafting trips are perfect for singles, couples, families and groups, and all abilities and ages, from 8 to 88 and make for the ideal rafting trips in Malaysia.